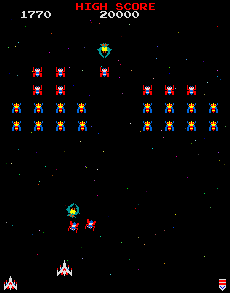 Galaga is a brilliant old-school shoot-em-up and it's a very worthy sequel to Galaxians, which was released a couple of years earlier in 1979. It plays in a similar way to its predecessor but with quite a few improvements that make it a much better game. The aliens are a lot more proactive and enjoy nothing better than swooping down at you in packs, firing laser bolts of death in your direction.